I have no idea how I came across this recipe, but I guess it doesn’t really matter! I bookmarked this recipe a while ago, and ran across it yesterday when I was looking for something to bake today. Who wouldn’t want to bake on the 4th of July? It’s only 99 degrees here, and cooler than it’s supposed to be the rest of the week. Perfect time to turn on the oven, right? My concession to the heat was to bake this morning, before it was too hot outside. I cook with quinoa frequently and like its versatility. I can use it for sweet or savory dishes, and it goes with most anything. 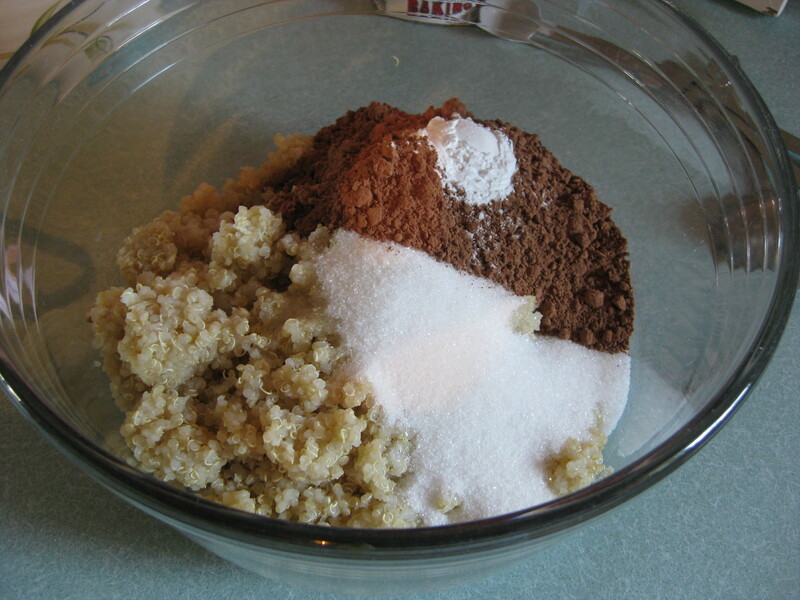 In this case, quinoa replaces flour to give substance to the brownies. I wasn’t sure how these would turn out, but the reviews were good so I thought they were worth the try. I’m glad I made them – they’re really quite good!! Click for recipe. These are very moist, more similar to the texture of a flourless chocolate torte than a brownie. The rich, chocolate goodness satisfied my chocolate craving, and so far I’ve managed not to eat the whole pan. (I’m so proud!) With proper blending, the quinoa isn’t noticeable, so if you’re looking for a healthy sneak or need something flourless, this is a good choice. 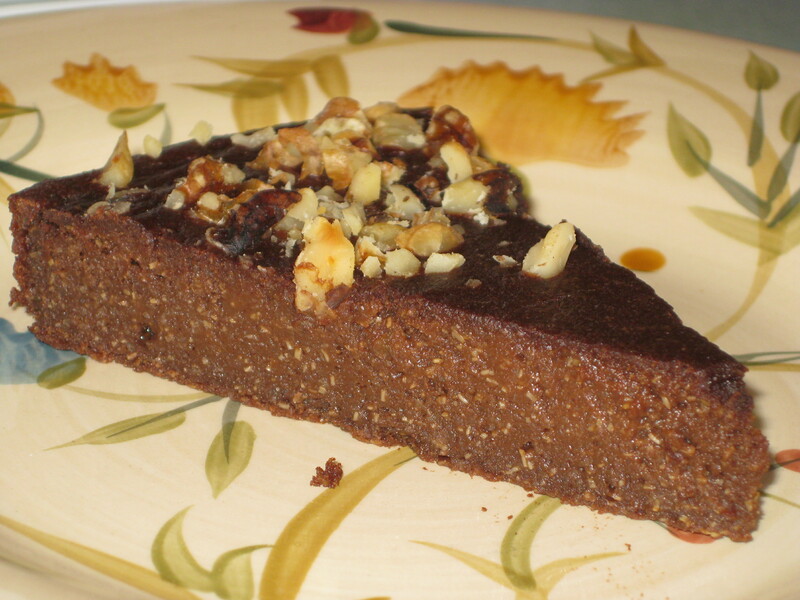 The only change I made to the recipe was to add ¼ cup of walnuts to the top before baking. I think nuts accent the chocolate flavor and I like the crunch factor. If you don’t like nuts, leave them off and sprinkle powdered sugar on top after they cool. If these were cut into squares, I think they’d be OK to handle and transport, but they’re very soft and will need some support. For some weird reason I don’t own square pans, so I used a 9” round pan. (My birthday’s coming up, so there’s a gift idea for someone!) Anyway, the wedges would be great for plating up with some fresh whipped cream and berries! Chocolate Quinoa Brownies are really easy to make – you put everything in a food processor and turn it on until your mixture is smooth, then bake! But I think I burned out the motor in my processor making Nutter Butter Truffles awhile back, and even if I didn’t, it’s boxed up in the garage and I was too lazy to get it out. Instead, I tried to use my stick blender. That didn’t work well; I think the mixture might have been too thick/dry. So it was on to my blender, which is quite sturdy and has a “Puree” function. 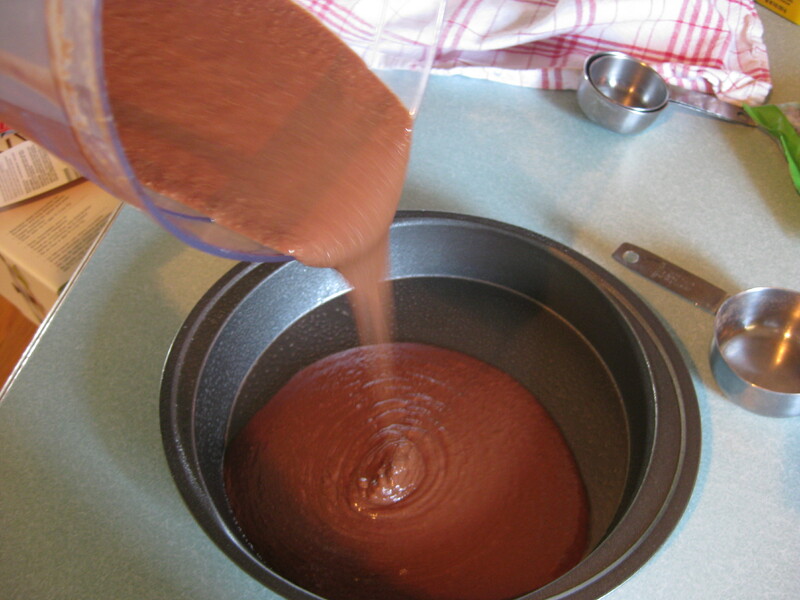 That worked splendidly, and after a couple of minutes of whirling blades, the brownies were ready to go into the oven. I wrapped a brownie and threw it into the freezer to see how they hold up. Hopefully, they’ll freeze well and I’ll have a stash ready for one of those times when I “need” a brownie! Note: The quinoa used in this recipe is cooked with more water than normal for a smoother texture. If you’re making a larger batch of quinoa and measuring out some to make the brownies, mine measured about 2 1/3 cups of cooked quinoa, but you might want to use a little less. If you’re using quinoa cooked with the normal amount of water, yours may be a bit crunchier. That’s probably OK – just something to be aware of! I’ve seen quinoa flour used, but not cooked quinoa. It does add to the moistness of the brownie! Your quinoa brownies are awesome……I could eat a whole pan!!! YUM YUM YUM……..I could eat the whole pan……can’t wait to make them! Thanks! They’re delicious and addictve! I took a couple to work to share with a friend. Enjoy!